Rusty Schlenk picked up his fifth Oakshade Raceway UMP Late Model feature win in the first Dual Push Truck Challenge feature event on Saturday night with Josh Scott finally getting his first ever Oakshade Raceway UMP Late Model feature win in the second feature. Schlenk started on the outside of the front row in the first 25-lap feature and immediately grabbed the lead over Rick Delong at the drop of the green flag. Jon Henry worked his way up to second by lap six, but Schlenk had already opened up a full straightaway lead. Henry was unable to close the gap as the race went caution-free all the way to the checkered flag, netting Schlenk his fifth win of the year as he continues to lead the point standings with only a couple weekends of Oakshade point racing left. Henry settled for second followed by Casey Noonan in third. Noonan is second in points and trails Schlenk by 152. Brian Ruhlman finished fourth and Dona Marcoullier drove up to fifth after starting 12th. Schlenk drew for a 10-car invert for the start of the second Dual Push Truck Challenge feature race forcing him to start mid-pack. Benefiting from the invert were Matt Lindsey and Josh Scott who started ended up on the front row. Scott assumed the lead at the start but had to work hard to maintain that position due to a multiple caution periods. After one caution for a Zac Davis spin, Scott drove too hard into turns one and two on the restart and slid way up high allowing a bunch of cars to get by. Luckily for Scott an incident involving Ryan Missler and Donnie Marcoullier brought out the yellow flag before another lap was complete. That reset the field to the lineup of the previous restart with Scott still at the point. 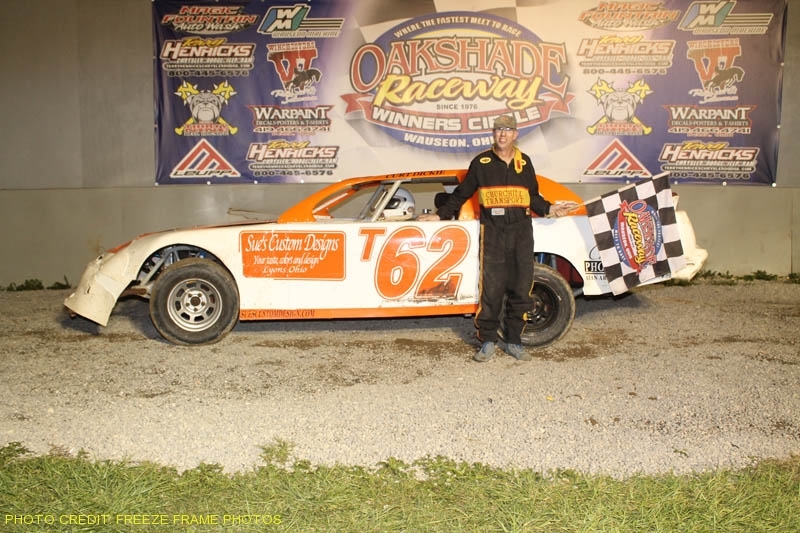 Scott didn’t make the same mistake of over driving his car and held off Rusty Schlenk to capture his very first Oakshade Raceway UMP Late Model feature win. Casey Noonan finished third once again followed by Devin Shiels and Brian Ruhlman. Bob Gregory started on the pole of the UMP Sportsman feature and led until outside pole-sitter Bob Mayer went by on the outside on lap five. Mayer’s lead was short-lived as Chris Keller, winner of both Sportsman Twin 25 feature two weeks ago, took control on lap seven. Keller pulled away to wrap up his third feature win in a row. Gregory moved back up to finish second with Tim Fisher third. Mayer slipped back to finish fourth with Bruce Stuart fifth. Chris Henry charged to the front of the UMP Bomber A Main after starting inside row two and appeared to have a car to beat, but he fell off the pace in turn four on the third lap. Henry coasted to the pits and was done for the night. Benefiting from Henry’s misfortune was Danny Hogrefe who inherited the lead. Tony Tolles pressured Hogrefe and both drivers battled side by side for a while exchanging the lead. Terry Rushlow and Jeff Foks closed in and joined the battle for the lead. Rushlow finally took the lead on lap nine and went on to hold off Foks to pick up the checkered flag. Tolles finished third with Bomber point leader Jim Scout ending up fourth. Hogrefe fell back to finish fifth. William Cundick started the Oakshade Hornet feature a little early from his inside row two starting position and led the field to turn one as the field took the green flag. A caution for Sharlene Reeves slowed things early in the race and Cundick served his penalty for passing before the start. The driver everyone chased the remainder of the race was Derek Morris who went on to win his fourth feature in a row with closed him to within five points of Hornet point leader Drew Smith who had mechanical issues earlier in the night. Cundick recovered to finish second ahead of Brandon Myers, Regan Ford and Cody Stetten. An action-packed Bomber B Main capped off the evenings racing program. Fred Burtch led the first half of the race and even survived an incident that just about took him and the second place car of Steve Morris when a lapped car came back on the track out the infield just in front of them. Both drivers spun, but Burtch kept going and was able to maintain his position as the yellow flag flew for Morris. Chris Sands passed Burtch for the lead on another restart as Burtch slipped to third. More cautions kept the field tight and allowed Morris to get back up to challenge for the lead. Morris was able to get by Sands for the lead after one restart, but some contact with Sands sent him spinning down the backstretch. Sands survived the race to pick up the victory over Brian Plotts, Satch Crispen, Shaun Sharp and Scott Robertson. Another full racing program is on tap for Saturday, August 20 featuring UMP Late Models, UMP Sportsmen, UMP Bombers and Hornets. Gates open at 4pm with racing starting at 7pm.